The best part of fall is being able to taste the seasonal flavors in one dish. For me, I love this time of year when apples are in it's prime picking season, apple cider is readily available and butternut squash is part of my grocery list. 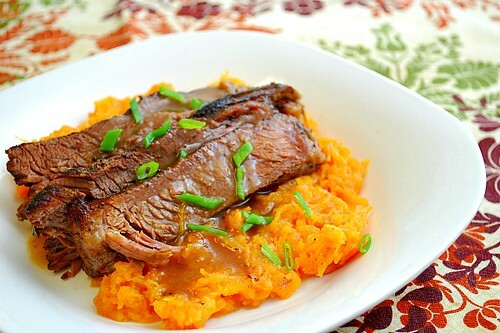 Together, apples and butternut squash make a delicious backdrop to slow braised pot roast. To tie everything together, a blend of apple cider, ginger and brown sugar make a lovely glaze to finish the dish. This Apple Cider Glazed Pot Roast will have you taste the best of fall and the best part is it takes little effort to get it on the table! I'm using my Instant Pot once again and this time I'm highlighting the flavor of apples. Apples and butternut squash is set as the bed for a beef roast to pressure cook in. If you're not a fan of beef, feel free to use a pork roast which will pair with the apples even more. (I used beef since it's what I had and it worked very well with the apple flavors.) After pressure cooking, the juices are used to flavor the mashed apple and butternut squash that will serve as the side dish. It's truly a one pot meal that's perfect for this season! Rub both sides of roast with salt, pepper and garlic powder and place in the hot skillet to sear, 3-4 minutes on each side. Transfer seared roast to the slow cooker and place on top of the apples and squash. Press SAUTE and add the oil. When the oil is hot, add the seasoned roast; searing to brown on all sides, about 5-7 minutes. Remove the roast from the IP and set aside. Place apples and squash on the bottom of the IP. Return the browned roasted to the IP and set on top of the apples and squash. Remove the roast from the IP, cover with foil to keep warm. Using a potato masher, mash the apples and squash together. Add the reserved juices to achieve the mashed consistency you prefer. Transfer to a serving dish. In the now empty IP, press SAUTE and add the remaining juices left. Bring to a boil to thicken slightly and then turn off the IP. Combine 2 tablespoons water + 2 tablespoons cornstarch to create a slurry. Slowly pour this mixture into the IP and stir until the remaining juices has thickened to a glaze consistency. Serve slices of roast on top of mashed apples and butternut squash with the glaze.